What interests us in the image is not its function as a representation of reality, but its dynamic potential, its capacity to elicit and construct projections, interactions, narrative frames.… devices for constructing reality. Vanguard art in the twentieth century began with the problem of its own overcoming – whether in the destructive, dadaist mode, which sought to tear apart the entire repertory of inherited forms and dissolve the very structures of the bourgeois ego, or in the expansive, constructivist mode, which sought to infuse architecture, design and the nascent mass media with a new dynamics of social purpose and a multiperspectival intelligence of political dialogue. Though both positions were committed to an irrepressible excess over the traditional genres of painting and sculpture, still they appeared as polar opposites, and they continued at ideological odds with each other throughout the first half of the century, despite zones of enigmatic or secret transaction (Schwitters, Van Doesburg…). But after the war, the extraordinarily wide network of revolutionary artists that coalesced around 1960 into the Situationist International (SI) brought a decisive new twist to the dada/constructivist opposition. 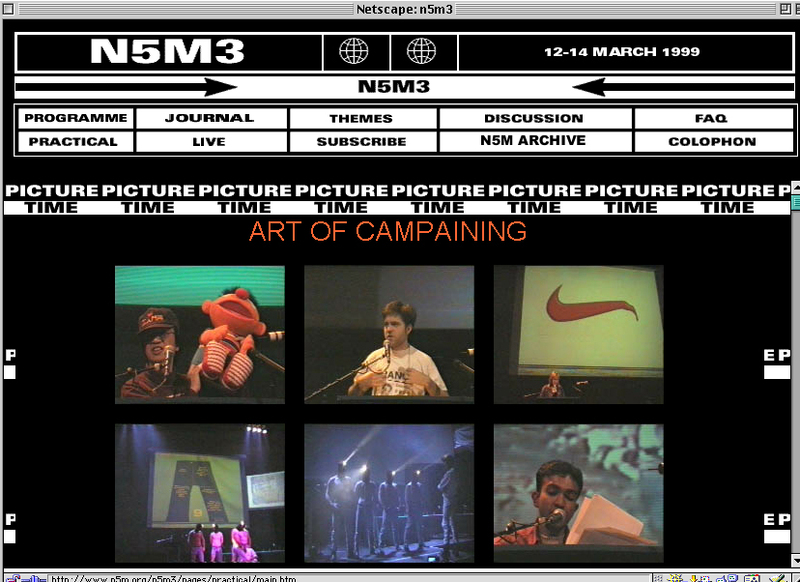 With their technique of “hijacking” commercial images (détournement), with their cartographies of urban drifting (dérive) and above all, with their aspiration to create the “higher games” of “constructed situations,” the SI sought to project a subversive practice of art into the field of potentially active reception constituted by daily life in the consumer societies. The firebrand career of the group was overshadowed by the political analysis of the Society of the Spectacle, a work that deliberately attempted to maximize the antagonism between the radical aesthetics of everyday life and the delusions purveyed every day by the professionalized, capital-intensive communications of the mass media. The SI foundered over this antagonistic logic, which led to the successive exclusion of most of its members. But with the notion of subversive cartography and the practice of “constructed situations,” it was as though something new had been released into the world. Without having to ascribe exclusive origins or draw up faked genealogies, it’s easy to see that since the late 1960s, the old drive to art’s self-overcoming has found a new field of possibility in the conflicted and ambiguous relation between the educated sons and daughters of the former working classes and the proliferating products of the consciousness industry. The statistical fact that such a large number of people trained as artists are inducted into the service of this industry, combined with the ready availability of a “fluid language” of détournement which allows them to exit from it whenever they choose, has been at the root of successive waves of social-and-aesthetic agitation that tend simultaneously to dissolve the very notion of a “vanguard” and to reopen the ambition to construct a real democracy. And so the question on everyone’s lips is, how can I participate? “This is a chord. This is another. Now form a band.”1 The punk invitation to do-it-yourself music gives instant insight into the cultural revolution that swept through late-1970s Britain. The unpredictable mix of hilarity, transgression and class violence in punk performance comes very close to the SI’s definition of a situation: “A moment of life concretely and deliberately constructed by the collective organization of a unitary ambiance and a play of events.” The relation between punk and situationism was widely perceived at the time. But there was also something else at stake, which was new by comparison to the disruptive tactics of the 1960s. Because the D.I.Y. invitation had another side, which said: “Now start a label.” The proliferation of garage bands would be matched with an outpouring of indie records, made and distributed autonomously. In this way, the punk movement marked a widespread attempt at appropriating the media, which in a society dominated by the consciousness industry is tantamount to appropriating the means of production.2 There is a constructive drive at work here: a desire to respond, with technical means, to the recording companies’ techniques for the programming of desire. In other words, this was a societal attempt to construct subversive situations on the scales permitted by modern communications. Something fundamental changes when artistic concepts begin to be used against a backdrop of potentially massive appropriation, with a blurring of class distinctions. A territory of art appears within widening “underground” circles, where the aesthetics of everyday practice is considered a political issue. It is precisely this transformation that must be understood, and theorized for the sake of a post-vanguard practice. It could be tracked through the radical fringe of the techno movement in the 1980s, with its white-label records produced under different names every time, its increasing recourse to sophisticated computer technology, its nomadic sound systems used for mounting concerts at any desired location. It could be explored in the offshoots of mail art, with the development of fanzines, the Art Strike and Plagiarist movements, the Luther Blissett project, the invention of radio- or telephone-assisted urban drifting.3 It could be grasped in community-oriented video art, alternative TV projects and the initial theories of “tactical media.” But rather than engaging in an archaeology of these developments, let’s leap directly to their latest period of fruition, in the late 1990s, when a rekindled sense of antagonism once again pushed aesthetic producers along with many other groups into an overtly political confrontation with social norms and authorities. This time, the full range of media available for appropriation could be hooked into a world-spanning distribution machine: the Internet. The specific practices of computer hacking and the general model they proposed of amateur intervention into complex systems gave confidence to a generation which had not personally experienced the defeats and dead-ends of the 1960s. Building on this constructive possibility, an ambition arose to map out the repressive and coercive order of the transnational corporations and institutions. Its corollary would be an attempt to disrupt that order through the construction of subversive carnivals on a global scale. Collective aesthetic practices, proliferating in social networks outside the institutional spheres of art, would be one the major vectors for this double desire to grasp and transform the new world map. A radically democratic desire that could be summed up in a seemingly impossible phrase: do-it-yourself geopolitics. 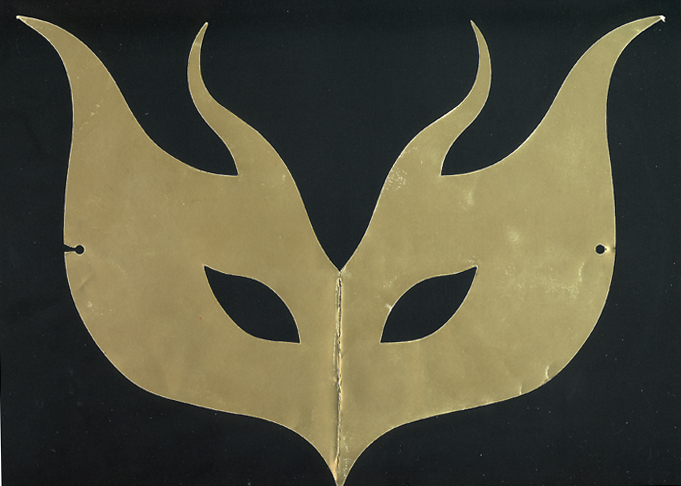 Those in authority fear the mask for their power partly resides in identifying, stamping and cataloging: in knowing who you are. But a Carnival needs masks, thousands of masks… Masking up releases our commonality, enables us to act together… During the last years the power of money has presented a new mask over its criminal face. Disregarding borders, with no importance given to race or colors, the power of money humiliates dignities, insults honesties and assassinates hopes. The music was supposed to come from speakers carried in backpacks. But no one could hear it above the roar. Four groups divided anyway, not exactly according to color; one went off track and ended up at London Bridge, to hold a party of its own. The others took separate paths through the medieval labyrinth of Europe’s largest financial district, converging toward a point which had been announced only by word of mouth and kept secret from all but a few: the London International Financial Futures & Options Exchange, or LIFFE building, the largest derivatives market in Europe – the pulsing, computerized, hyper-competitive brain of the beast. The trick was to parade anarchically through the winding streets, swaying to the samba bands, inviting passing traders and bank employees to take off their ties or heels and join the party, while a few smaller groups rushed ahead, to dodge tremblingly into alleyways and await that precise moment when a number of cars would inexplicably stop and begin blocking a stretch of Lower Thames Street. The sound system, of course, was already there. As protesters shooed straggling motorists out of the area, larger groups began weaving in, hoisting puppets to the rhythm of the music and waving red, black, and green Reclaim the Streets flags in the air. The Carnival had begun, inside the “Square Mile” of London’s prestigious financial district – and the police, taken entirely by surprise, could do nothing about it. Banners went up: “our resistance is as global as capital,” “the earth is a common treasury for all,” “revolution is the only option.” Posters by the French graphic arts group Ne Pas Plier were glued directly onto the walls of banks, denouncing “money world,” proclaiming “resistance-existence,” or portraying the earth as a giant hamburger waiting to be consumed. The site had also been chosen for its underground ecology: a long-buried stream runs below Dowgate Hill Street and Cousin Lane, right in front of the LIFFE building. A wall of cement and breeze blocks was built in front of the entrance to the exchange, while a fire hydrant was opened out in the street, projecting a spout of water thirty feet into the air and symbolically releasing the buried river from the sedimentations of capital. In a historical center of bourgeois discipline, inhibitions became very hard to find. This was a new kind of political party: a riotous event, in the Dionysian sense of the word. 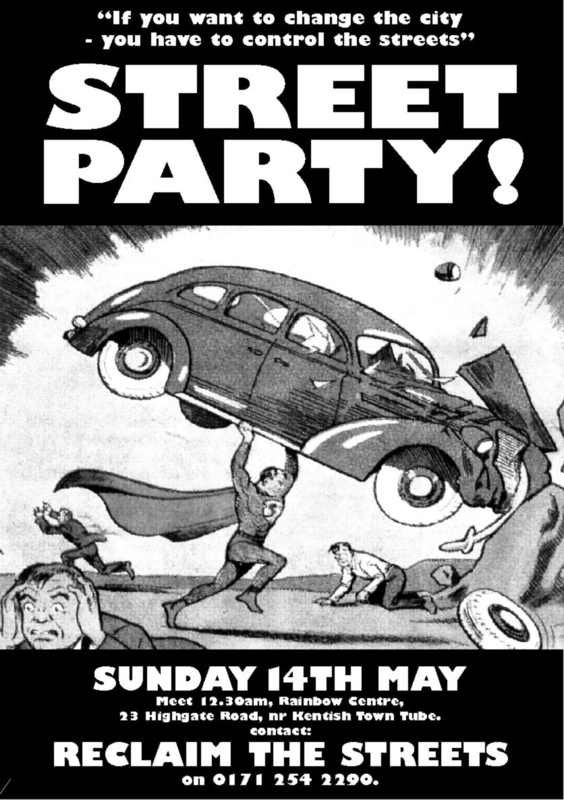 This event was imbued with the history of the British social movement Reclaim the Streets (RTS), along with other groups such as London Greenpeace (a local eco-anarchist organization). RTS is a “dis-organization.” It came out of the anti-roads movement of the early 1990s, struggling against the freeway programs of the Thatcherite government. Its members employed direct action techniques, tunneling under construction sites, attaching themselves to machinery, putting their bodies on the line. 1994 had seen a summer-long campaign against the M11 highway link, which involved squatting the condemned residential district of Claremont Road and literally inhabiting the streets, building scaffolding, aerial netting and rooftop outposts to prolong the final resistance against the wrecking balls and the police. But it was also the year of the Criminal Justice Act, which gave the authorities severe repressive powers against techno parties in the open countryside, and politicized young music-lovers by force. After that, the ravers and the anti-roads protestors decided they would no longer wait for the state to take the initiative. Drawing inspiration from a 1973 text by the French philosopher André Gorz, “The Social Ideology of the Motor-Car,”6 they decided to reclaim the streets in the middle of London, and party at the heart of the motorcar’s dominion. 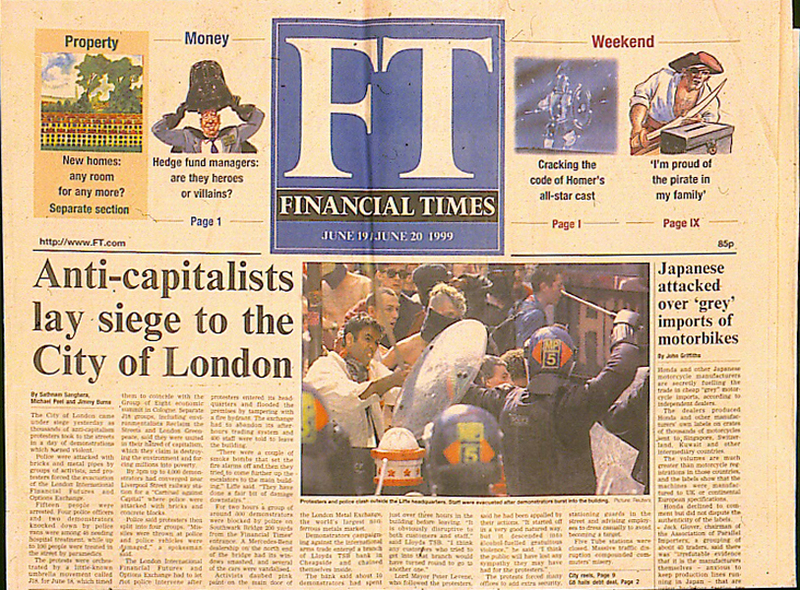 The first RTS protest was held in the spring of 1995 in Camden Town, where hundreds of protestors surged out of a tube station at the moment of a staged fight between two colliding motorists. Astonished onlookers watched as the two drivers each took out sledgehammers and began destroying their own vehicles. Meanwhile the street was occupied and the festivities began. Techniques were subsequently invented to make “tripods” out of common scaffolding poles: traffic could be easily blocked by a single protestor perched above the street, whom police could not bring down without risk of serious injury. News of the inventions spread contagiously around Britain, and a new form of popular protest was born. Later events saw the occupation of an entire stretch of highway, or a street party where sand was spread out atop the tarmac for the children to play in, reversing the famous slogan of May ‘68 in France, sous les pavés, la plage (“beneath the paving-stones, the beach”). The work of the Russian critic Mikhail Bahktin on the political potential of the carnival found a new home outside of literary theory. 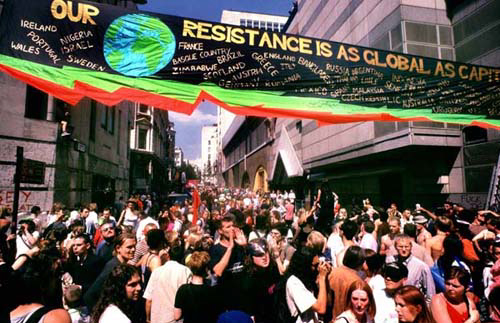 From here, it was just another leap of the imagination to the concept of the global street party – first realized in 1998 in some thirty countries, within the wider context of the “global days of action” against neoliberalism. J18 was not an artwork. It was an event, a collectively constructed situation. It opened up a territory of experience for its participants – a “temporary autonomous zone,” in the words of the immensely popular anarchist writer Hakim Bey. With respect to the virtual worlds of art and literature, but also of political theory, such events can be conceived as actualizations: what they offer is a space-time for the effectuation of latent possibilities. This is their message: “another world is possible,” the slogan of the World Social Forum. But what’s also a relief to see is how the recent political mobilizations help make another world possible for artistic process, outside the constituted circuits of production and distribution. The concept of tactical media was worked out at the Next 5 Minutes conferences, which took place in Amsterdam from 1993 to 2002, at three-year intervals.11 David Garcia and Geert Lovink summed it up in 1997: “Tactical Media are what happens when the cheap ‘do it yourself’ media, made possible by the revolution in consumer electronics and expanded forms of distribution (from public access cable to the Internet) are exploited by groups and individuals who feel aggrieved by or excluded from the wider culture.”12 The key notion comes from Michel de Certeau, who described consumption as “a set of tactics by which the weak make use of the strong.”13 At stake is the possibility of autonomous image and information production in an era dominated by huge, capital intensive structures and tightly disciplined networks. But De Certeau spoke of oral, premodern cultures, whose intimate, unrecorded practices could appear as an escape route from hyper-rationalized capitalism; whereas the tactics in question are those of knowledge workers in the postindustrial economy, much closer to what Toni Negri and his fellow-travelers would call the “multitudes.” With their DVcams, websites and streaming media techniques, the new activists practice an “aesthetic of poaching, tricking, reading, speaking, strolling, shopping, desiring…. 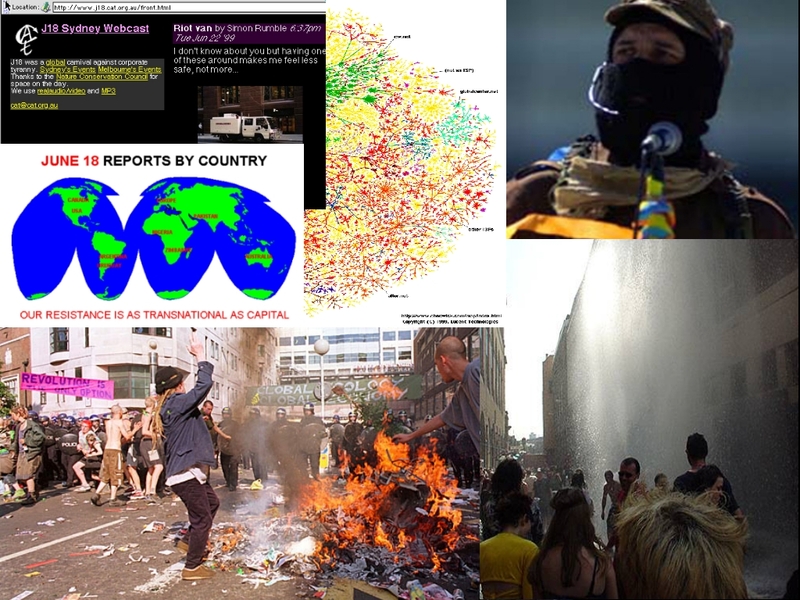 the hunter’s cunning, maneuvers, polymorphic situations, joyful discoveries, poetic as well as warlike.” This was the spirit of Next 5 Minutes 3, in the spring of 1999, just as the alterglobalization movement was about to break into full public view. The reversal of biopower into biopolitics brings tactical media – and all the forms of post-vanguard art – into a larger circulation of struggles, where what is distributed are the means of empowerment, i.e. the means of self-creation. The subversive carnivals of the turn of the century embodied this production of a new political subjectivity, at grips with political power but also able to temporarily turn away from it, to celebrate a prefigured social transformation in the here-and-now of the occupied streets. With the cycle of struggles that unfolded from 1999 to 2003, a new territory of experience gained consistency. Densely interwoven with political analyses, but also with aesthetic images and affects, this mobile territory shifted its ground from city to city, in a round-the-world tour culminating with the massive protests of February 15, 2003, which reached planetary scale but did not stop the war. Capitalizing on the feelings of sadness and depression that followed this immense cry for peace, politicians and sociologists quickly proclaimed the death of the movement, because their deepest desire is to control everything alive. But the street is no longer the same, struggles always come back from their periods of latency and what we call “art” is now freer, more protean, more resistant in the wake of those tumultuous years. When you think back on it today, June 18th and all that followed looks like an irreverent but amazingly constructive way to usher in the arrival of the twenty-first century. 1 From a cover of the early punk fanzine Sniffin’ Glue (1976-77), reissued in the anthology edited by Mark Perry, Sniffin’ Glue: The Essential Punk Accessory (London: Sanctuary Publishing, 2000). 2 On punk appropriation politics, see Dan Graham, “Punk as Propaganda,” in Rock My Religion (Cambridge: MIT Press, 1993). 3 For the Art Strike and Plagiarist movements, see the books and sites by Stewart Home, particularly Neoism, Plagiarism & Praxis (Edinburgh and San Francisco: AK Press, 1995) and Mind Invaders (London: Serpent’s Tail, 1997). For the Luther Blissett Project, see http://www.lutherblissett.net, or a collectively written novel like Q (Arrow, 2004). 4 What’s written here is mainly based on participation in the event, retrospective conversations (especially with John Jordan), the websites http://rts.gn.apc.org and http://www.agp.org, photos by Alan Lodge at http://tash.gn.apc.org, and a superb text entitled “Friday June 18th 1999” in the eco-anarchist journal Do or Die 8 (London, 1999), available at http://www.eco-action.org/dod/no8/index.html. 5 The full mask text can be found in Do or Die, op. cit. ; it is partly plagiarized from Subcomandante Marcos, “First Declaration of La Realidad,” available at http://www.eco.utexas.edu/Homepages/Faculty/Cleaver/firstrealidad.html. 6 The Gorz text can be found on the RTS website, available at http://rts.gn.apc.org/socid.htm. 7 At least one video is distributed, J18 (First Global Protest against Capitalism), available at http://www.cultureshop.org. Increasing numbers of documents can now be found on the Internet. 8 See http://www.active.org.au and the diagram where one of the programmers sketched a chain of cooperation in the invention and use of the software, available at http://www.active.org.au/doc/roots.pdf. 9 For much more on the direct-action side of the alterglobalization movement, see the illustrated book We Are Everywhere (London: Verso, 2003). 10 See http://www.nettime.org and the book ReadMe: Ascii Culture and the Revenge of Knowledge (New York: Autonomedia, 1999). 12David Garcia and Geert Lovink, “The ABC of Tactical Media,” quoted from http://thing.desk.nl/bilwet/Geert/ABC.txt. 13 Cf. Michel de Certeau, The Practice of Everyday Life (Berkeley: UC Press, 1988). 14 This and the preceding two quotes are from Michael Hardt and Antonio Negri, Empire (Cambridge: Harvard UP, 2000), pp. 23-25; available at http://www.angelfire.com/cantina/negri. 15 Interview with André Gorz by Yann Moulier Boutang and Carlo Vercellone, “Economie de la connaissance, exploitation des savoirs,” in Multitudes 15 (Winter 2004), pp. 208-9. This entry was posted on April 27, 2007 at 7:09 pm and is filed under 1. You can follow any responses to this entry through the RSS 2.0 feed. You can leave a response, or trackback from your own site.